We seem to be on track for a world record in Silent Auction futility. The silent auction has been going for 2 hours and they have raised a total of $225. Of course, after one hour they were at about $25, so I guess it is picking up. Everyone is in the dining room now, so I do not anticipate this group even raising our minimum. People are just not that interested in the silent auction tonight. It is a high-school class reunion group that has decided to raise money for "Fast Forward for Literacy". We knew it would not be a big night because there are only about 110 people and only about 50 items. But, I never imagined it would be this pathetic. I am not even really paying attention to it. I am watching the Broncos pre-season game on Sling Box. The Broncos don't look that great either. This damn thing goes until 11pm. I was only supposed to work the during-event, but we were low on resources, so I had to be in charge of setup. At least it was a pretty easy setup. 14 bids in the system now. The Broncos are down 7 to 13. Almost half time. Offensive holding on the Broncos. 10 yard penalty. 16 seconds left until the first half is over. We are up to $300. The customer owes us $1500 for our services. I hope they at least make the $1500. The only reason our fee is so low is because they signed the contract a year and a half ago when our fees were about half what they are now. By 2009, the goal is for me not to have to do any of these events. I cannot wait. 18 bids $335. 2 hours and 38 minutes left. Broncos down 7 to 16. One interesting thing about this event is that they are also having a casino night. 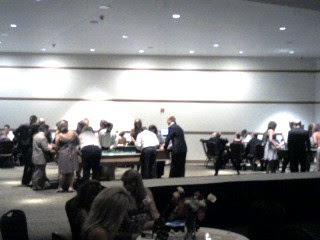 People seem to be more interested in the gambling than they are in the silent auction. My wife is now trying to watch T.V. I am screwing with her by pressing pause. I wonder if she realizes what is going on. I'm not very nice when I am bored. We are up over $1000 now. We have an hour and 18 minutes left. I was just told to lower the minimum bid on a big-ticket item, so I think the total is going to jump up by $1,600 pretty soon. We might actually get above our fee. Sweet. Although I was sort of excited about breaking a record. Of course even with the $1,600 we are probably going to break the futility record. Apparently, our employee, Mark is wheeling and dealing to get people to buy things at a reduced price. But, it has been several minutes since we lowered the trip to Cancun to $1,600, so I am a little confused. Maybe they got "cold feet". Well, no sense boring my Blog readers any more on this subject. Right now, we are at $1,026 with 1:10 left in the auction. I am assuming that soon some of these huge price cuts on the big-ticket items will bear fruit and we will jump above our fee for the total. Maybe. I need a nap. It is going to be a real late night.